In celebration of American architect Frank Lloyd Wright's 150th birthday this week, we're looking back at five of his most pioneering projects. Next up is the Hollyhock House, which was influenced by the style of seventh-century Mayan temples. Located in the East Hollywood neighbourhood of Los Angeles, Hollyhock House was completed between 1919 and 1921. As Wright's first house in Southern California, it marked a change from the Prairie style he had explored in the American Midwest and "consummated" in his 1910 Robie House in Chicago. Licensed with a free reign he described as California Romanza, the architect was searching for a modern style suited to Southern California, and turned to influences from pre-Columbian Mexico. These can be seen in the home's inclined upper walls and colonnades, which bear a similarity to the shapes of temples in Palenque – a Mayan city state in southern Mexico built during the seventh century AD. This residence marks one of the earliest examples of Mayan Revival, a modern architectural style that grew in the 1920s and 1930s. Wright also used the stacked shape of a Mesoamerican pyramid to inform his Imperial Hotel in Tokyo and is known as a key leader of the movement. 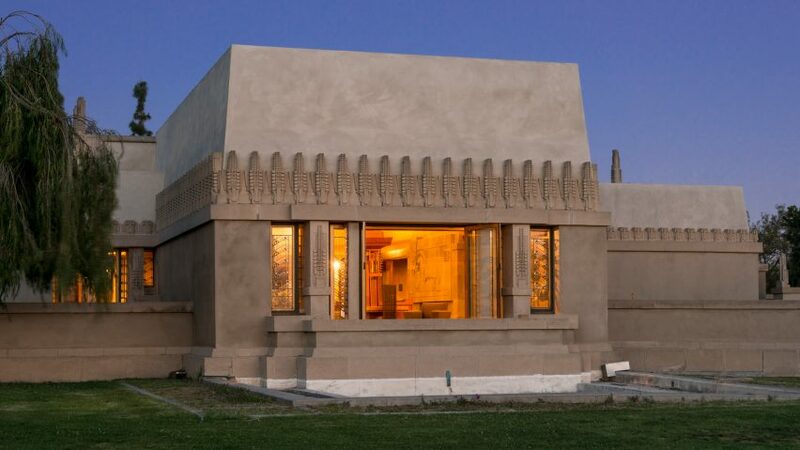 Wright designed Hollyhock House as part of a commission from oil heiress Louise Aline Barnsdall to create an avant-garde theatre and cultural complex called Olive Grove. Of the entire complex, only the residence and two apartments were completed. In response to Barnsdall's request for a "half house, half garden", the home is arranged around a central courtyard. At one end it opens to a circular pool with a fountain in the middle, which is wrapped by semi-circular seating. Each of the rooms inside the house also leads out to a variety of external spaces, including porches, pergolas and a narrow pool. The upper level provides access to rooftop terraces, which are linked by bridges and staircases and offer impressive views to Los Angeles basin and the Hollywood Hills. Ornamental hollyhocks, Barnsdall's favourite flower, wrap the upper level of the cast concrete exterior, and were used to decorate furniture and windows. These are some of a series of ornamental features in the house, including a large concrete-bas relief fireplace that forms the centre of the living room. Inside, spaces transition from tight corridors to large and open-plan rooms. Once completed, the huge house included seventeen rooms and seven bathrooms. During the project, Wright and Barnsdall encountered a series of artistic differences. The architect was designing the Imperial Hotel in Japan at the same time and so apparently left a lot of decisions to his son, the lesser-known Lloyd Wright, and the Austrian-born American architect Rudolph Schindler. Towards the end, Barnsdall fired Wright from the project and the house was finished by Schindler, who later urged Richard Neutra to join him in Los Angeles. Afterwards the trio – Wright, Schindler and Neutra – all created projects in the Californian modernist style. In 1927, Barnsdall donated the residence and its surrounding 11 acres (4.5 hectares) of land to the City of Los Angeles so that it could be used as a public park in memory of her father. Over the years the residence fell into disrepair, as a result of earthquakes and design faults. In the early 2000s, Project Restore undertook a major renovation of the residence and it reopened to the public in 2015. Hollyhock House is now part of the Barnsdall Art Park Foundation, and the park is used for art classes, working studios, a gallery, and a theatre – returning full circle to Barnsdall's original ambitions for the site. The 8 June 2017 marks the 150th anniversary of Frank Lloyd Wright's birth, and a series of activities are taking place across his buildings to mark the occasion. Events include the opening of MoMA's major retrospective of his work in New York on 12 June 2017.